As luck would have it I managed to get a family free Sunday and decided to head up the coast and check out a few events. After making sure the classic was in order to tackle 300 odd kays I left Sydney under the cloak of darkness heading for the Morisset Swap Meet, a lazy hour and half up the freeway. 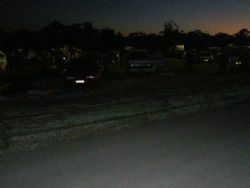 Most of the vendors had camped overnight and I thought the kick off time of 6.00am was a little optimistic, mainly because it was pitch black at this time of year. I was dreaming of course. I turned up at about five past six and as expected it was darker than the ace of spades but the die hards were all there, torches in hand, looking for that elusive early bargain. I couldn’t believe it. You would think with the onslaught of technology and sites like eBay swap meets would be relegated to history but I saw no evidence of that on this dewy, misty morning. Being a city slicker I inappropriately turned up in thongs, only to have my feet covered in dew, dirt and grass on the freshly mowed surface of the Morisset Showgrounds. 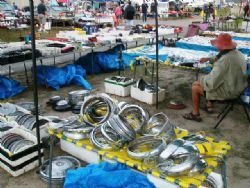 Lots of automotive pre loved treasures, bric a brac and more than a bit of absolute junk was for sale by a large number of vendors. The food kiosk was doing a roaring trade in bacon and egg rolls and the coffee vendor had a big smile as well. There were plenty of lookers and as the sun rose the crowds got thicker and a few of the lazier vendors awoke to find guys picking over their trailers of stuff. 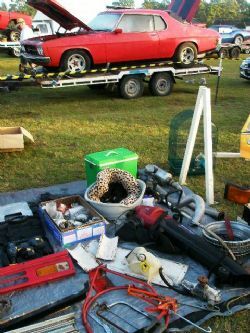 A few cars were for sale, sitting atop trailers in various states of assembly and even though it was run by the Central Coast Holden Club there were plenty of parts for Ford and other marque enthusiasts to pour over. They say one man’s junk is another man’s treasure and it is never truer than at a swap meet. Guys were buying stuff that I wouldn’t even bother taking to the tip and a couple of the vendors were in raptures of the sale of some stuff that even they couldn’t believe someone would buy! I headed out at 9am and there was still a good stream of cars coming into the event and I reckon everyone would have been pretty happy with the outcome. Selling or looking, there was something there for everyone and the vibe was very hospitable. 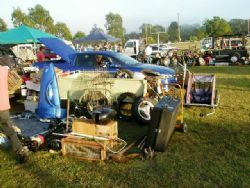 If you like a bargain or are looking for those elusive parts this swap meet should be on your calendar for next year.